Modern life is filled with technology that is both highly portable, adaptable, and instantly accessible; just look at our smart phones, tablets, and laptops. Well, ADJ has taken these important traits and customer needs on board in the design and features of both its Dotz Par and Dotz TPar System; creating two lighting solutions that are versatile, portable, and cost effective. The Dotz Par uses a 36-watt Tri (RGB) COB LED and 35 built-in color macros to produce a powerful wash of color, while the COB LED technology ensures smooth RGB color mixing for an endless array of vibrant colors, with no RGB shadows. Using its 60-degree beam angle the Dotz Par allows users to achieve an incredibly wide and far-reaching wash effect – which makes the unit perfect for flooding stages, dance-floors or even church auditoriums with dense color. Offering users a useful alternative, the Dotz Par also comes with a lens kit included, so the beam angle can be conveniently reduced to a concise 25-degrees; making the fixture equally as suitable for use in combination with smoke and fog or for providing tight up-lighting effects to emphasize décor, light stage curtains, or color venue walls. Mesmerizing strobe and pulse effects also allow users to produce more of a party feel for their audience; creating atmosphere on the dance-floor or during a stage production. The Dotz Par can also be pixel mapped for stunning visual effects when used as part of a large light show and the unit’s 0-100% dimming means it really can be used for any event; whether it’s soft white light or bright, hard-hitting explosions of color that is needed. It’s this versatility which makes the Dotz Par such a useful tool for mobile DJs, stage production companies, club and bar owners and lighting technicians. Not only does it reduce the number of units that users need to purchase, but it also makes for an easily portable (and storable) lighting setup; saving mobile entertainers, in particular, the hassle of setting up and transporting multiple independent fixtures. Lighting technicians can easily daisy chain up to 13 Dotz Par fixtures at 110V (and 28 at 230V) to reduce the wiring required for more extensive lightshows, while intelligently designed power and DMX Ins/Outs sit sideways, so that the units can be set flat on the ground or even positioned inside truss. Users can choose from five operational modes – Auto Run, Sound Active, Color Macro, Dimmer, and DMX-Controlled – with DMX mode allowing a further choice between four different channel modes: 3, 4, 5, or 9. Using the compatible ADJ Par RF wireless remote controller, users can trigger Sound Active mode; select built-in, auto-run and fade programs; and select static color mode – allowing easy operation from up to a 25m distance. ADJ understands that mobile entertainers, bands and touring performers have enough to think about when they’re on the road – and a complex, weighty lighting system only adds to the impracticalities of setting-up and taking-down an ever-expanding arsenal of stage equipment. Always looking to innovate and keep its products versatile, ADJ decided to design a product which would keep things practical and portable for the touring artist, using the technology from its Dotz Par fixture. ADJ’s new COB LED wash system, Dotz TPar, takes four of the powerful Dotz Par fixtures and packs them into a convenient, portable, one-bag lighting solution. Ideal for the on-the-go lifestyle of mobile DJs and function bands, this all-in-one system includes a tripod stand, foot controller, remote control and protective gig bags – including a stand bag, and a soft case for storing the lighting system away safely. 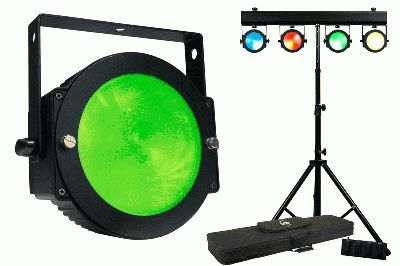 The highly-portable product uses four 30-watt Tri-color (RGB) COB LED heads, mounted on a T-Bar system, and a 90-degree beam angle to produce wide, vibrant color washes and offer smooth RGB color mixing. The Dotz TPar system really does provide touring bands, stage performers, and mobile DJs with the ultimate easily controllable, all-in-one lightshow. Just like the Dotz Par individual fixtures, users can fit the lens kit – which comes included – to achieve a 25-degree angle and a tighter, more concise beam effect. Party-enhancing strobe and pulse effects can also be activated – adding that extra high-energy kick to any event. The Dotz TPar System gives users four operational modes to choose from; aside from Sound Active, Auto Run, and Built-In Programs, users can operate in DMX-512 mode using an external DMX controller. Five DMX-channel modes are available: 3, 5, 9, 12, and 18; allowing users to select color macros and built-in programs, adjust RGB color mixing, and activate strobing effects, amongst other control features. Where the advantages of the Dotz TPar system really begin to show is in its practicalities, as ADJ has designed the system to be extremely versatile and efficient to use. One aspect which bands and performing musicians will benefit from hugely is the included wireless foot controller – which can sit conveniently next to instrument effects pedals, and allows musicians to activate in-built lighting programs and operate the system while they are performing. (Just like with the Dotz Par, the compatible ADJ Par RF wireless remote controller can also be used, which may be more suited to the needs of the mobile DJ.) The system also includes a secure lighting stand, and conveniently adjustable fixings that allow users to mount two additional lighting fixtures on top of the T-bar using easy-to-tighten plastic thumb screws. To make users’ lives even easier, these extra effects can be plugged into convenient power output sockets located on the back of the bar; so multiple fixtures can draw from the same power source. These extra fixtures can be operated via the wireless controller – becoming an integrated part of the lightshow – or turned on and off using a DMX board while operating in 5, 9, or 18-channel DMX modes. The Dotz TPar’s fixtures use low-heat-emitting LEDs so that performers remain cool on stage; meaning they can concentrate on staying calm and collected to deliver their best possible show. Due to the whole system weighing in at a dainty 35 lbs. (extremely light for a four fixture setup), the Dotz TPar is easy to carry in and out of gigs, lift into transport, and store away.